Ireland’s largest little tern colony at Kilcoole, Co. Wicklow, has enjoyed a record year in 2014 according to conservationists monitoring the site. Wardens recorded 120 breeding pairs nesting at Kilcoole this season, smashing the previous record of 106 pairs from 2006. According to figures reported on the Kilcoole Little Tern Conservation blog an estimated 219 chicks successfully fledged — another record-breaking figure, and great news for one of Ireland’s rarest breeding seabirds. This year was also the first year that wardens at Kilcoole ringed the young birds. 135 fledglings had colour-rings fitted to help researchers identify individuals in the future. It’s a move that’s already paying dividends with a colour-ringed juvenile little tern from Kilcoole reported at Hilbre Island in the Dee Estuary on the Wales England border on the 10 August. Interestingly Hilbre Island is just across the estuary from one of the UK’s largest little tern breeding colonies at Gronant on the North Wales coast. Kilcoole little tern fledgling re-sighted at Hilbre Island, some 190 km from where it hatched. The re-sighting, and others like it, will provide valuable insight into how young terns move around the Irish Sea before they return to West Africa for the winter. The little tern colony at Kilcoole has been protected by wardens during the breeding season since 1985 under a joint initiative run by BirdWatch Ireland and the National Parks & Wildlife Service. 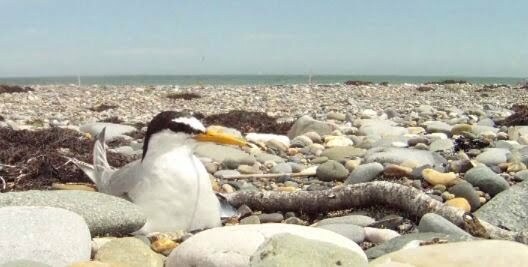 For more information visit the Birdwatch Ireland Little Tern Conservation blog.